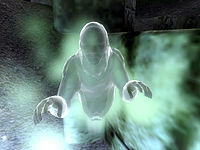 The ingredient Ectoplasm can be collected from Ethereal Undead. Five ectoplasm samples are required for the Fighters Guild quest Drunk and Disorderly. 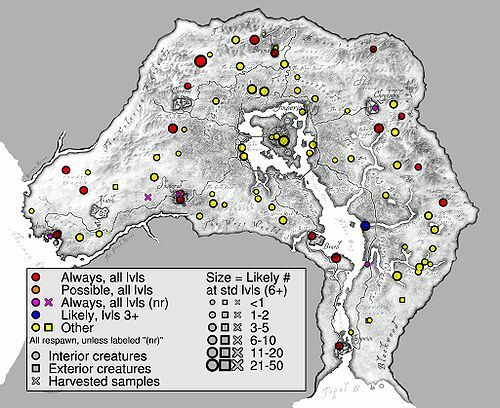 A sample of Ectoplasm is one of the possible offerings to initiate Meridia's daedric quest (Bonemeal or Mort Flesh also work). It can also be found randomly in the inventories of alchemy vendors (starting at level 4) and in some Necromancer and Vampire loot chests (starting at level 4). Ectoplasm is obtained from almost every type of Ethereal Undead creature, including standard Ghosts, Ancient Ghosts, Faded Wraiths, standard Wraiths, Gloom Wraiths, Sanctified Dead, and Spectral Sailors. These creatures are most commonly encountered in Undead Dungeons where, starting at level 6, there is a roughly one in three chance that any undead will be ethereal. Undead also spawn using the same leveled lists in Vampire and Necromancer Dungeons. Sancre Tor has 26-30 ethereal undead (but can only be entered after starting the quest Blood of the Divines). Rielle has 6 ethereal undead (2 more likely above level 6, based on probabilities for each creature to appear and be an ethereal undead). Vahtacen has 7 ethereal undead (but the undead can only be reached after starting the quest Vahtacen's Secret). Wendir has 4 ethereal undead. Malada has 4 ethereal undead. 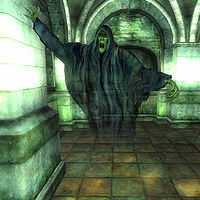 The undercrofts of the chapels in most cities contain Sanctified Dead, which are respawning ethereal undead creatures and can provide a good source of ectoplasm if you can gain access to the undercrofts (the Pilgrimage quest added by the Knights of the Nine makes all chapel undercrofts accessible; alternatively, the locks can be picked or opened using spells). 11 Benirus Manor Ghosts occupy Benirus Manor in Anvil during the quest Where Spirits Have Lease (the first three ghosts will respawn as long as you do not advance the quest). 5 Spectral Sailors inhabit the Serpent's Wake in Anvil during the quest The Ghost Ship of Anvil. 5 standard ethereal undead are in the wreck of the Emma May at the Mouth of the Panther during the quest The Forlorn Watchman. This page was last modified on 29 April 2014, at 19:52.